The GMS800 is an innovative family of extractive analyzers which can measure more than 60 different gases. The GMS800 is characterized by its modular design: seven analyzer modules, one gas module, I/O module, and a local operating/display unit. Standard 19″ racks can be used for economic system integration in cabinets. Wall mounting enclosures with optional Ex approval for hazardous areas can be used in rough industrial environments. Equipped with modern software, the GMS800 comes with all the standard interfaces for remote control via networks through to connection to process control systems. 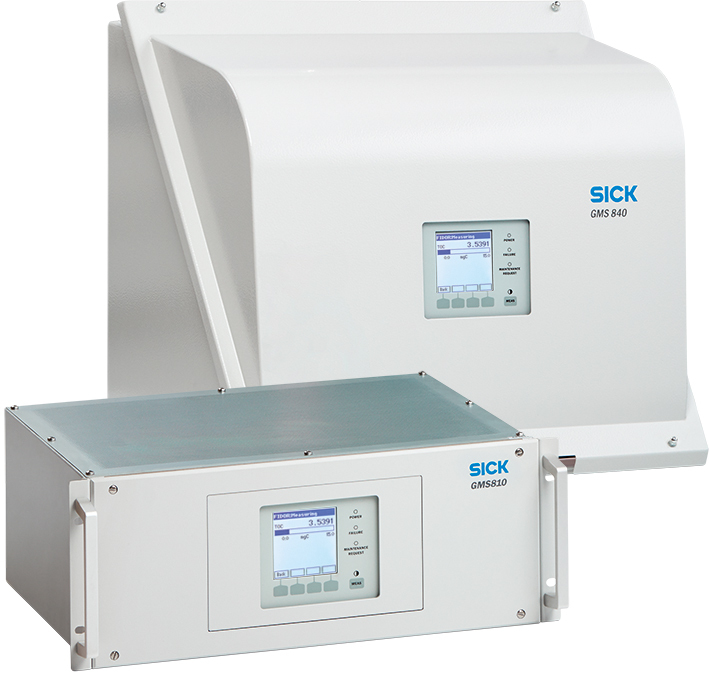 The modern DEFOR (NDUV/UVRAS) analyzer is a specialist for extremely selective NO measurement, while also providing direct monitoring of NO2 and SO2. The highly selective UNOR (NDIR) analyzer is especially insensitive to external vibrations due to its variably adjustable chopper frequency, and the multi-component MULTOR (NDIR) analyzer can measure of up to 3 gases plus H2O for internal cross-sensitivity correction. Internal calibration cells are optionally available on all three analyzer modules. Oxygen measurement is provided by the high precision OXOR-P paramagnetic analyzer, also available in solvent-resistant or corrosion-resistant, or the electrochemical OXOR-E module. Rounding out the range of gas modules is the THERMOR thermal conductivity analyzer, and the FIDOR flame ionization detector (FID) for continuous measurement of hydrocarbon emissions. The GMS800 is approved to all worldwide emission monitoring standards, and can be installed in general purpose or Ex areas (NEC 500/505 Division/Zone 2) without purging. Easy maintenance and simple upgrade of existing installations is possible due to the modular design, as well as minimal service and repair effort due to replacement of complete modules or assemblies. Reliable measuring results are guaranteed by proven measurement technology and minimal influence of ambient temperature through thermostatically controlled modules. Save on expensive test gases and the long-term cost of daily validation with optional internal calibration cells, and NOX monitoring without a catalytic converter by direct measurement of NO and NO2.